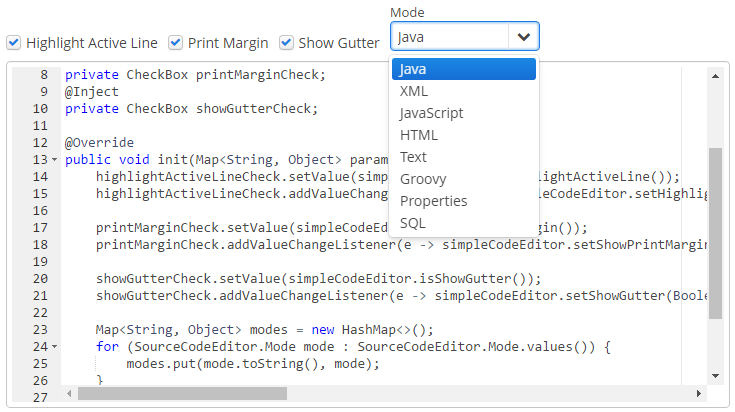 SourceCodeEditor is designed to display and enter source code. It is a multi-line text area featured with code highlighting and optional print margin and gutter with line numbers. XML-name of the component: sourceCodeEditor. SourceCodeEditor is implemented for Web Client. if handleTabKey is true, the Tab button on the keyboard is handled to indent lines, when false, it is used to advance the cursor or focus to the next tab stop. This attribute should be set when the screen is initialized and will not work if changed at a runtime. highlightActiveLine is used to highlight the line the caret is on. printMargin attribute sets if the printing edge line should be displayed or hidden. showGutter is used to hide or show the left gutter with line numbers. Below is an example of SourceCodeEditor component adjustable at a runtime.